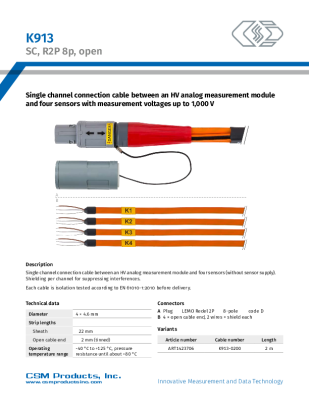 HV AD ECAT Modules up to ±1000 V | CSM Products, Inc.
HV AD4 XW1000 measurement modules provide four analog inputs and are specifically designed for the measurement of high voltages in high-voltage environments. 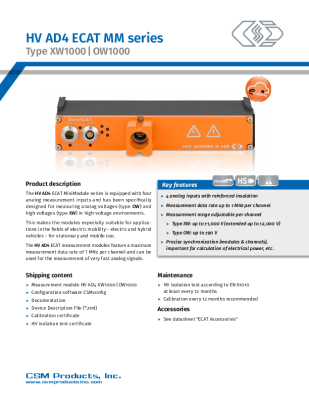 Due to housing design and technical specifications, these measurement modules are particularly suited for mobile and stationary use, e. g. on test benches, in the field of e-mobility (electric and hybrid vehicles). 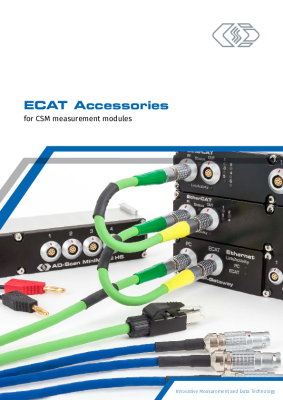 HV AD4 ECAT measurement modules offer a maximum measurement data rate of up to 1 MHz per channel and can be used for the acquisition of very fast analog signals of up to 1,000 V (peak). precise synchronization (modules & channels), a key criterion for power calculation, etc.